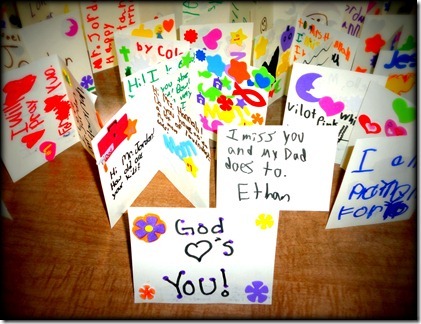 Thank you Springville Road Community Church Children for your sweet cards! It is so encouraging to know that children are praying for us and learning about missions. The kids had some really cute comments from “Mrs. Hannah do you have a lot of laundry? My mom does.” and “I love you very much that I can’t breathe.” to a simple “I am praying for you.” We love it! Keep ‘em coming!